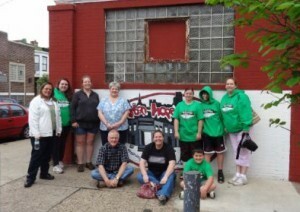 A group from Grace Community Church in Richmond, Va., recently spent time helping at Urban Hope in Philadelphia. A group from Community of Grace Church (CGC), Grace Brethren congregation in Richmond, Va., recently returned from a life-changing weekend at Urban Hope Training Center in inner-city Philadelphia. Team members were given great training by Urban Hope director Jason Holt and by Ed Lewis. The team then split into four groups that went into the neighborhood for prayer walks and prayer talks. “Urban Hope has a solid reputation in their community and we were glad to continue to show the love of Jesus Christ with these brothers and sisters,” said Pastor Dave. Highlights also included preparing sack lunches and eating with the homeless in downtown Philadelphia. The Richmond church blessed the team with close to 300 pairs of new socks which the team was able to give to many grateful homeless people. The evening concluded by praying for the city on the steps of the Philadelphia Museum of Art. The team worshiped at Urban Hope Church on Sunday and give an offering of $465. “It was so cool to see people that we talked to on Saturday night attending church that morning with us,” noted team member Caitlin Callister. CGC praises God for the partnership the Fellowship of Grace Brethren Churches has with Urban Hope which the church will continue to embrace in the future.